I finished the binding on my son's quilt last night so it is now on his bed!! I used wool batting as they like their quilts light and fluffy and my son chose the panto design, he picked Happy Times. Their room is starting to look more mature now that I painted over the bright yellow walls with light blue and bought them bunkbeds with a nice dark brown stained. I repainted their red dresser a nice espresso brown and added some brushed nickle knobs. It is hard to believe that dresser was mine when I as a baby! Okay so now to my dyeing story. I thought this time when dyeing a backing I would piece the fabric first and then dye it as one whole piece...sounds good right. The color and texture turned out great but for some reason one piece of fabric didn't take the dye like the rest. ??? Sigh. What did I do wrong this time? After some discussion with my other 'dyer' friends about my backing dilemma it seems to be that I might have washed that one piece in regular laundry soap instead of our dyers TNA soap...who know it would make that much of a difference! 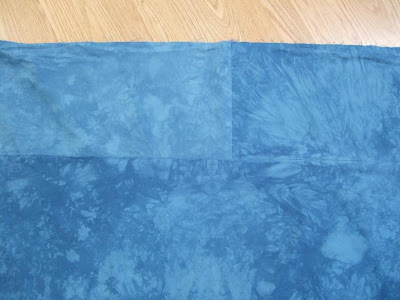 It is the same fabric but from a different bolt so that could be a factor too. So from now on I will only use fabric from the same bolt that have been washed together before I piece the backing together. 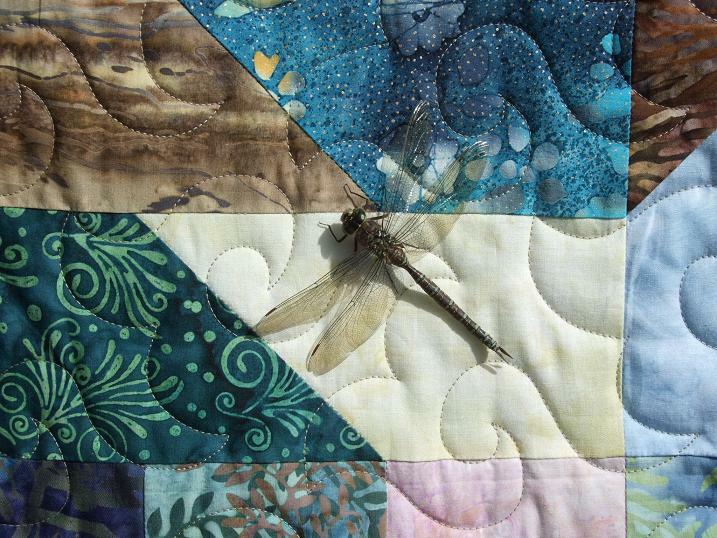 I loved how the texture of dyeing the whole piece hides the center seam, it is very hard to see. I used beige thread on the top and navy on the bottom and to prove to those nay sayers that you can't use two different color threads on top and bottom here is the proof. It is so important to learn how to use that tension knob, don't be afraid to turn it!!! Had a little visitor check out the quilting too. 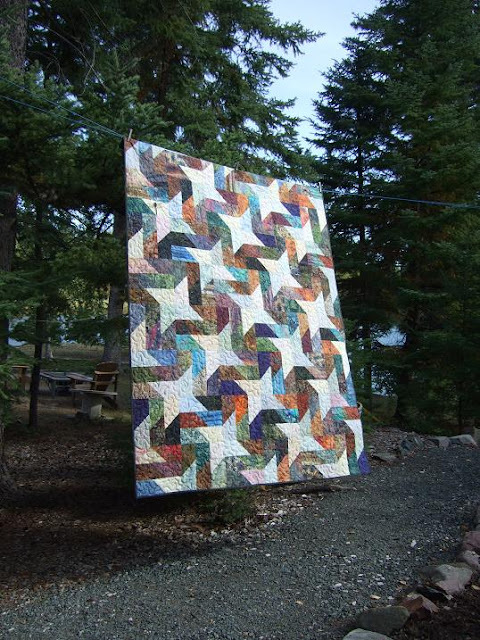 You are such an inspiration Kathy, when I need to get going on quilting projects I check out your blog and you inspire me to "finish up my stuff". 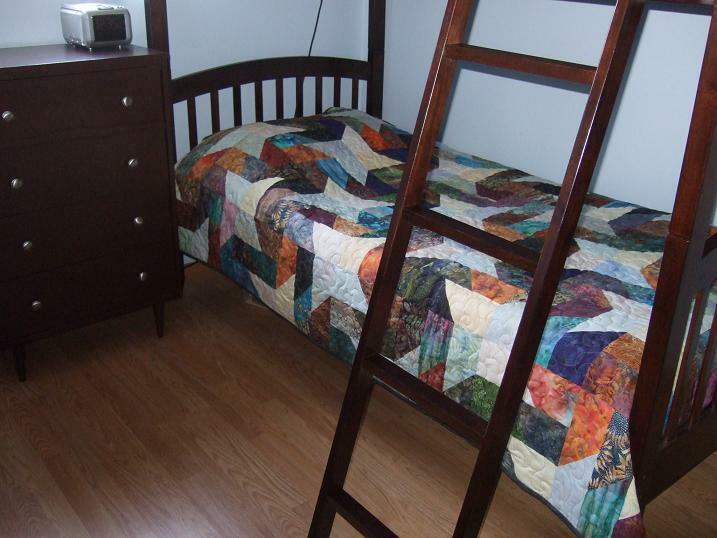 Great quilt, perfect choice for your son's room. I think it is wonderful. You always have the eye for color matching. 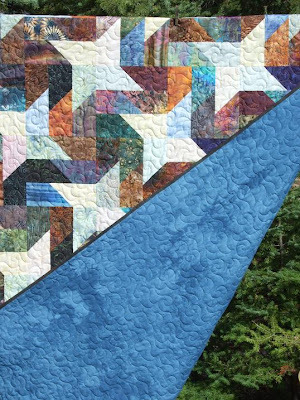 Hi Kathy, Love your choice of pattern and fabrics for your son's quilt. Just perfect for a young man. He's bedroom is looking very grown up, I would bet he loves it. 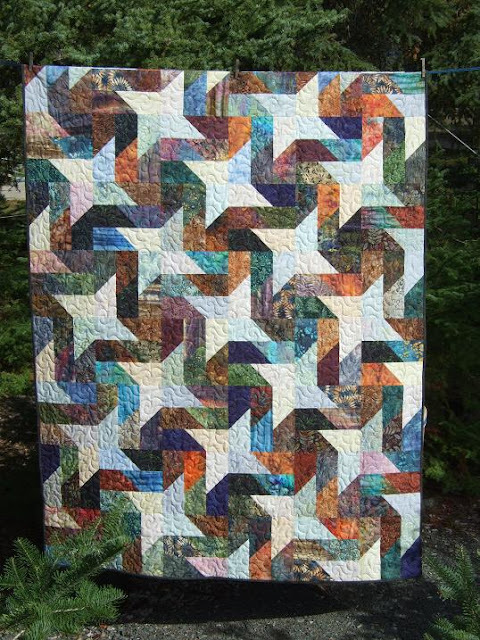 Thanks for sharing your fabric dyeing dilemmas, it is such a cool backing! I too often use different colours top and bottom and find it works well for me. Quilt on!